As a woman, there are few things in life, that cure what ails us better than chocolate. Right? Isn't that how it is supposed to be? I agree, somewhat. But for me, it is vanilla, or cinnamon. I swear, something about cinnamon toast, absolutely takes me to the happiest place ever, when I need some comfort. Don't get me wrong, I love chocolate, but, it isn't my cure all, as it is for many. 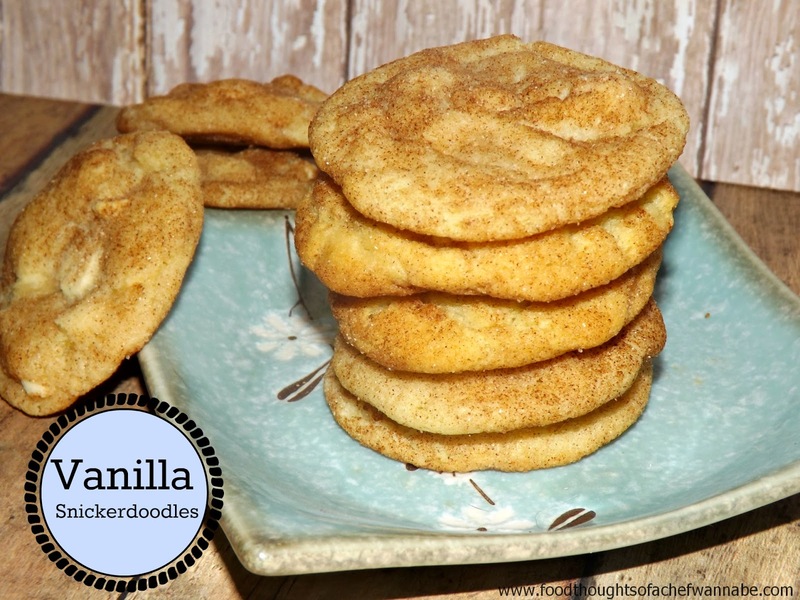 When I decided to make snicker doodles, which I obviously, LOVE, I wanted to make a twist on them. Well it was no question, it had to be add vanilla. Easy, right? Add vanilla to my regular plain old recipe which I got from www.cooks.com a hundred years ago and call it good. No, no, no. That wasn't just going do the trick, I needed to bite vanilla. Cinnamon and vanilla, I die. I DIE. So with the addition of some of my fantastic homemade vanilla extract and some vanilla chips, these are addictive, healing, love, fluffy bunny slippers and pink clouds all rolled into one bite. Mix together to combine. You will roll your dough balls in this! Preheat your oven to 375 degrees F. In a bowl combine, butter, shortening, eggs, vanilla and sugar until creamed together smoothly. In a separate bowl, combine flour, cream of tarter, baking soda and salt. Sift together into the wet mixture and mix just until combined. Fold in vanilla chips. Roll dough into balls, dip in the cinnamon sugar mixture and place on a parchment or silicone mat lined cookie sheet. (can also use nonstick cooking spray) Bake for 8-10 minutes. I bake for 8 since I like very soft cookies. Cook on a rack and consume, as many as possible as soon as possible.